As humans living on this planet, we are inseparable to every single event recorded as it transpires in the timeline histories of this planet, equal in all of its beauty, magnificence and in its brutal events of horrific trauma. Each one of us exist as the “recorded” nerve cells in the body of the planet and have the entire planetary history recorded in our nervous system and the layers of our physical body. Of course most of us walk around with little to no memory of our past lives, or planetary history in order to comprehend how it has radically shaped our current life experience. Our planet as a celestial body is humanities “macrocosm” and is created in the mirror image to our own individual human body “microcosm”. All manifested forms are governed by creational laws set in by an architectural blueprint that exists at multiple dimensional layers. These Laws exist at multiple layers of the auric or consciousness fields and they directly control the physics of manifested creation. It means that nothing is manifested into a form that is outside of a specific blueprint that projects that actual image into physical substance and therefore physical matter. Human Beings, Extraterrestial Beings, Planets, Stars, Suns all have a specific blueprint governing them. When there is a larger collective blueprint governing a smaller species blueprint (the macro to micro relationships), such as for the human race on Earth, or another planet, or the universe, that collective body blueprint is referred to as a “logos”. As such we refer to our Planet’s Logos. Our Planetary Logos (the original blueprint and “law” governing the Earth’s planetary body) exists at the Ultraviolet spectrum of our magnetosphere on the 7th dimensional level or the Violet Ray. 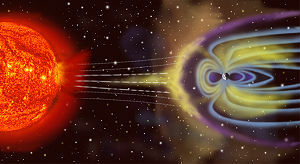 (The above picture depicts the earths magnetosphere interacting with our Sun.) This is also the Plane of the “Violet Ray” and where an aspect of the future Earth exists called Gaia. The 7th dimensional logos connect to a vast circulatory system that make up the collective human “crown chakra” and its projected “higher mental body” of the planetary function connected to the United Kingdom areas. (So what we see on the planet today is the manifestation of a group thought-form.) The architecture of the planetary logos controls every aspect of the planet, from the physical elemental substances to the emotional, mental and “energetic quanta” or “life force” distribution. It is the main control mechanism and circuit board that governs the planet in every inconceivable way. Clearly, these functions also greatly influence (or control) human beings to perceive themselves to what we believe as a group consensus - to be the behavior/identity of a human being living on planet Earth. The planetary logos is the macrocosm function to the collective mind and microcosm function of the individual mind. Planet Logos=Planetary Brain=Collective Race Mind=Human Mind=Individual Brain. All of these aspects of intelligence are a interactive part of the planetary logos. The term “Planetary Logos” is also a way of describing the processing functions that direct messaging into the planetary “brain”. (This is similar to a computer processing unit/CPU chip used in computers ) These messages in the planetary brain influence and control every living thing on this planet. There are message impulses being artificially programmed to create mind control, brain dysfunction and nerve synapse blocking. If we are informed and aware of these energy assaults against our consciousness, we can override them by maintaining inner spirit connection as the priority message received and shielding our energy aura. The Planetary Logos is a part of the Ultraviolet wave spectrum at the 7th layer of planetary consciousness which is connected to a humanities crown chakra and the first level of intelligence of the Monadic Matrix. The Monad Matrix is a spiritual triad body and a part of our identity and memories at the future space time of 7D Earth. In 2012 the planet received stellar activation which accelerated the potential for monadic embodiment. This page was last edited on 29 June 2018, at 21:37.